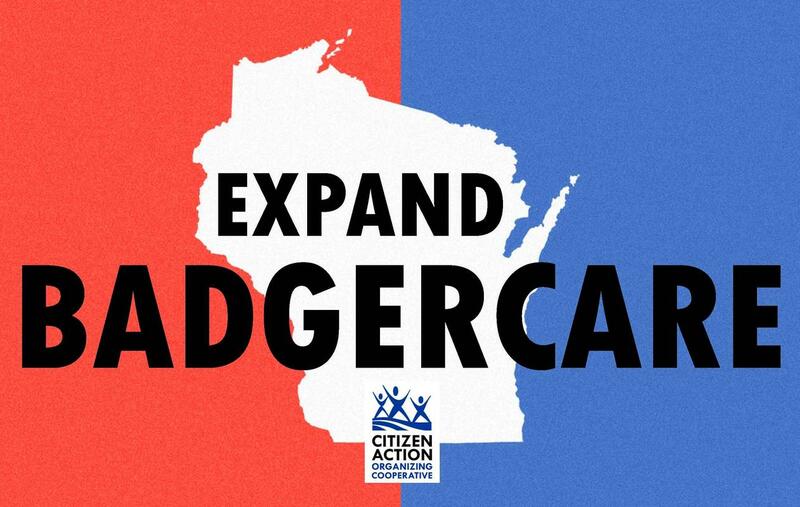 Citizen Action members, supporters and coalition allies are preparing to attend public budget hearings in Wisconsin to weigh in on state budget priorities, including BadgerCare expansion. Hearings appear to be in April in (1) Janesville, (2) Milwaukee, (3) River Falls, & (4) Green Bay. The hearings will be all-day week-day events where attendees can speak for only 2 minutes about their concerns. Let us know if you can attend and if you can bring others! "I can help with this fight around the state budget public hearings..."* This field is required NOTE We don't yet know the exact address of these hearings but we believe we know what city and dates, so pledge if you think you might be able to go to one within 60 minutes of you, during the day-time on a week-day. ...I want to learn more about buying a Citizen Action union-made t-shirt for $20 with our state budget healthcare-for-all demands ! Our members will be attending these State budget public hearings in t-shirts with our clear demands for healthcare-for-all and a healthcare system (whether in hospitals, schools or nursing homes) that works for all! Get yours for $20! I don't live within an hour of any of these places! (Or I can't make any of these dates work) What can I do? ...plan on bringing a full car of other people to the event, at least 2-3 more! "To be successful at the public hearings I would like from Citizen Action..."
T-Shirt: would you wear a t-shirt with Citizen Action's demands and logo on it so we both can find each other in the crowd and so elected officials can see how many of us there are? 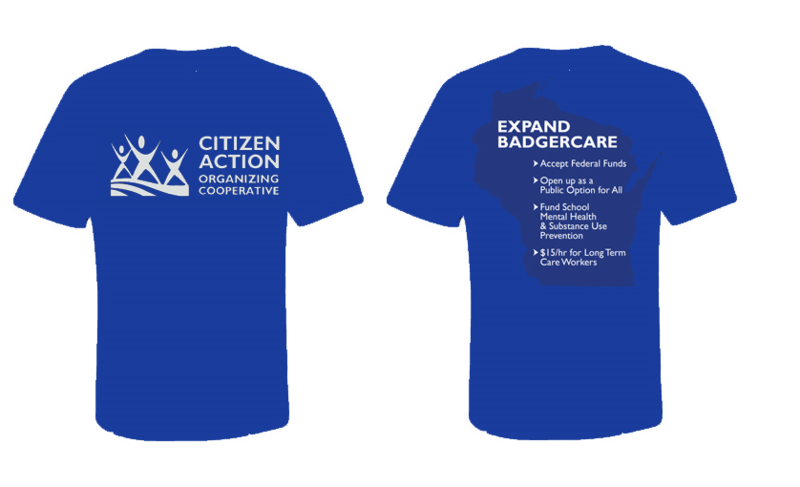 Our shirts are blue with our logo on the front, and on the back list four priority issues: (1) BadgerCare expansion, (2) a BadgerCare Public Option, (2) substance use/mental health support in schools, and (4) $15 an hour living wage for direct care workers helping people with disabilities and senior citizens. T-shirt Size (Optional) NOTE! If you would like multiple, please email Kevin.kane@citizenactionwi.org or if you don't want a shirt, just hit "next"
(Optional) Send a postcard to the GOP State Senate on BadgerCare expansion and on Fair Maps ($1 for printing and postage) (Pick up to 2) The Senate is the major roadblock to Fair Maps & expanding BadgerCare. These letters will flood Senate offices urging this Legislature to act and informing them that we are organizing as Citizen Action in many of their districts. So either the Legislators say YES to BadgerCare & Fair Maps or we will work to build a moral movement to elect new leaders. Almost done! One more question - should we organize more in your area of Wisconsin? We are organizing people in key areas to launch "Organizing Co-ops", critical mass of local members contributing monthly dues of about $20-$30 per month to hire a local organizer. Would you be interested in learning more about how we can build a co-op in your area? I already am a co-op member, thanks! I'd be interested in joining ONLY IF we find that critical mass in my area. Let me know!